Spent some time on the project again today. Decided that I'd better listen to 38ac and get my flywheel keys in proper. It took removal of a little more material than I thought it would from the keys but in the end I've got them in much better. One of my flywheels does not quite run true, but with the key in proper it seems to be slightly better than it was. The key on that one was not in but maybe an inch, and was probably tilting the wheel on the shaft. That wheel also has evidence that someone with a big hammer was hammering the edge of the hub, mostly above and around the keyway. Not sure why, but probably where hammering in the key and missed a bunch. The taper on mine seemed to be fairly well matched to the keyway, once they tightened up they were making contact nearly everywhere at once. Most of the material I removed from the flat bottom of the key, as the whole thing needed to sit lower to get all the way in. Only needed some light filing on the tapered section to knock down a few rough spots and a few dings from the hammer man. Both wheels looked fine upon inspection of the bores so in theory they weren't damaged by my test runs. Hopefully I've gotten the keys correctly shaped and they stay tight. Accidentally got one in just slightly farther than my puller can get behind so that maybe interesting at some point, too. Still plenty of room for a wedge type puller though. Also spent some time with the governor spring and linkages. With the rpm adjusted down to 550, there were a couple of problems. The first was that with the spring tied to the factory hook, there weren't enough threads to get down to 550. So i added a small washer hooked between the spring and the hook to get the threads back in a reasonable spot, but this created a problem for starting. The spring would cease pulling open the rack a little before the rack reached full open. Sometimes on startup, the governor would close the rack up until the spring started acting again, but it was not always enough fuel on a cold start to keep things accelerating while getting both decompression levers moved into the run position. Without that little bit of spring to open the rack back up as the engine started to stall it was annoying. Once both cylinders were firing it would be a little sluggish to get to speed set point, but would maintain fine with the constant fan load I have for it right now. Probably would not be the best with a large variable load. The other issue I've had is the slop in the linkages, sometimes there would be considerable movement on one side with none on the other, as well as everything moving back and forth with vibrations, probably contributing to some minor hunting. So I found a couple of springs that were the best I could do at the half sold out spring display at the hardware store. After much looking around, I decided to place them as you see in the photo, one on each pump. The springs aren't very strong and are barely stretched with the rack closed. They are hooked into the pin hole from both sides to even out the twist on the yoke and prevent binding. They provide enough tension to keep the linkages tight against the main governor spring. This tension also allowed the elimination of the washer and further adjustment so the governor spring is always in tension even with the rack open fully. I suppose they would close the racks upon some failure with the rest of the system as well. It seems to be better responding than it was, but probably still a little less responsive than it was with just the original spring with the rpm set for 650. I think it would be better if the springs added at the pumps were just a little lighter pull. But it is a little more consistent on startup now. This has also eliminated the slop in the linkage, as all pins are under tension at all times, and movement of the rack on one side is instantly mirrored by the other side. It was a warm day today, and the dogs really liked the wind from the yard fan. They figured it was a nice place to nap in front of. Also did some test running of the air compressor with the 'roid. Seems to work well. Set the compressor up to clutch itself when it reaches pressure, and then restart when pumping up is needed. I might need a longer spring on the governor, seems that there is quite a bit of drop with the addition of the 5HP load of the compressor in addition to the fan load before it catches up to speed. A gentle bump of the rack by hand when the load is added gets it right back up to speed so it isn't over loaded, just slow to react. It does get back up to speed on its own, just takes it the better part of a minute to do so. The system can also be adjusted so that the pump runs continuously and cycles just by the unloader if one is doing something with a large compressed air demand to reduce the clutch cycles. In the video it is just dumping some air back to the atmosphere to provide a false load for the compressor to cycle on. Continuous operation reduces the speed fluctuations some what, as the compressor remains turning throughout and is somewhat less of a power fluctuation to the unit when it cycles. The clutch saves a noticeable amount of power during the unload cycle though so it appears to be worth the effort. The video shows a couple of cycles while in clutch operation. Very clever... Rube Goldberg would be proud! I love your gadgets and gizmos. This made me smile and laugh. Tons of fun there. Loved the compressor video, and admire your designs! 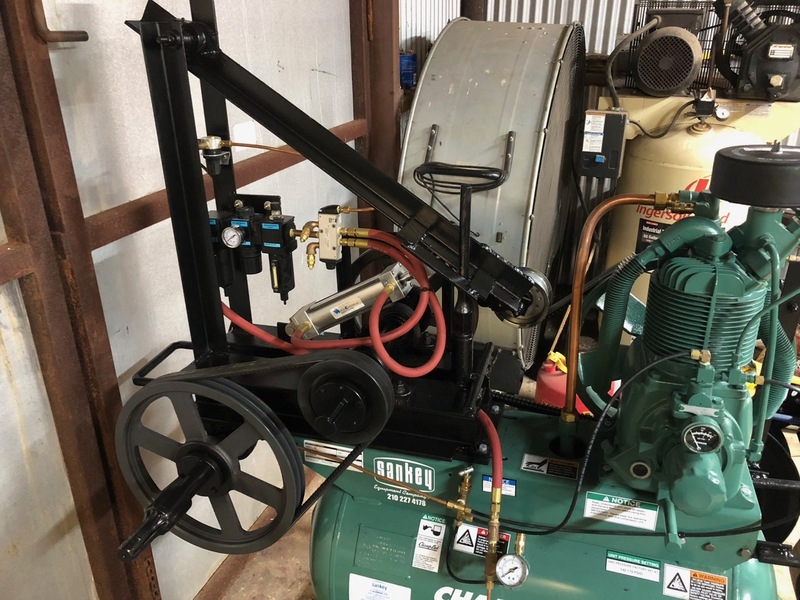 I've been thinking about adding a clutch to my 6/1 air compressor; I have been using just the pneumatic unloaders but it still loads the engine more than I'd like. For your clutch- how are you avoiding belt wear during unloading (slack belt)? I see you added pump cam oiling also. That governor is purdy lazy acting you should be able to get it a bit better than that. Glad its fun to watch. Thats part of the reason I made it. Also, the video doesn't do it justice, its really the most pleasant air compressor I've ever been around partly to the nice pump, but a lot to do with the engine noise as well. As far as belt wear, most of the belt is guided away from the moving pulley when its slack. There are guide pegs around to help the belt maintain a favorable shape when it is loose. There is sometimes some contact on the top edge of the pulley, but the belts are kind of floating there being held up by their natural shape, so any contact is minimal. If I notice that it is a problem, I could probably help it stay off the top of the pulley with a hook on the idler arm placed so that it guides up the belts just a hair more when the arm is fully raised. There are also some adjustments in the guide pegs that could get the belts moved into a little better position with some tinkering with the adjustments. I don't have enough run time on it to tell if wear is going to be a problem. I have not noticed any heating or signs of damage to the belts as of yet. Yes, the cam oiling seemed like an excellent idea, and was pretty straightforward to implement with your instructions. I suspect the governor does not like my linkage tightening springs, they are probably too stiff. I'm chasing down some alternatives that should get the job done with less force. A longer spring down on the adjustment arm would also help, the short one it came with rapidly decreases its force as the rack nears full open, and thus it isn't as able to overcome the slight spring pressure from the linkage slop springs anymore. Its too bad that the hardware store here seems to have a large rack of all types of empty slots for springs and never seems to have any of the smaller ones in stock. I could size up something close by feel, but a list of specs to order one might be a shot in the dark. I'll see about venturing to a few other stores sometime this week. I also found and corrected an intermittent binding on the far side arm under the pump. It was allowing the lever under the pump to get too far to the side and that would cause binding if everything was in the right spot, but not all the time so it was hard to find and I had missed it when I initially went through the linkages. I suspect it was able to bind more often when the engine was in operation than it did when it was shut down. A further de-burr of the pivot and the addition of a thin washer as a spacer cured it. Although this helped the laziness, it was not a cure. I felt like a kid watching that arm tighten the compressor belt. Seems to do it as if by magic! I can't see belt wear being a problem. 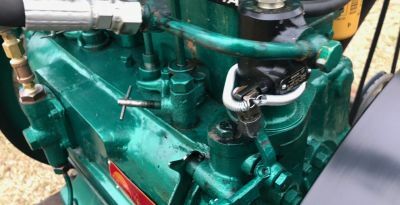 They are a lot tougher than people give them credit for and the setup and operation of the tensioner seems to cause very efficient take up and release. In any case belts like that would not be very expensive so if you had to replace them every year, who cares? I have a mate that does air con that gets big blowers like that often with burnt out motors. I'm thinking I might get one of him and pput a coupling or pulley on it so I could drive it off an engine the same way. Thanks for your insights, 2Ton46. I've been thinking about a pneumatic powered tension device for my 6/1 driven compressor much like your hydraulic arm, vs a jack shaft driven by a flat belt which can be shifted to an idler of same diameter. Just a matter of comparing which is easier to implement now. No hydraulics here, all pneumatic. That cylinder does look a lot like a hydraulic cylinder though. The system operates by two air sources. The first source is direct from the tank and is plumbed into the filter / regulator / lubricator then through a control valve and ultimately to the cylinder. The control valve is an air operated spring return affair that simply switches one side of the cylinder to the air source and the other to exhaust, and flips the sides when activated. The weight of the arm is such that it will provide enough tension on the belts to allow starting the compressor with no air in the system. As air builds in the tank the cylinder is defaulted to pull down on the arm. It only takes about 5 to 10 psi in the cylinder to move the arm to is lowest position. The idler is spring loaded to provide even tension and a small range of over travel for the arm. This side of the system is set at 30 psi, partly to control noise and to ensure enough force is available. Once the tank pressure rises above 30 psi the regulator keeps the cylinder pressure at 30 regardless of the tank pressure. Cylinder speed is controlled by a combination of exhaust flow control - mufflers, and this particular cylinder also has an end cushion on the downward stroke that further slows the last inch or so of the downstroke. Without these the arm movement is pretty much instant - pretty scary in my opinion. The 2nd air source is the control. It is piped from the pilot unloader valve through a small regulator and into the control port on the air/spring control valve. 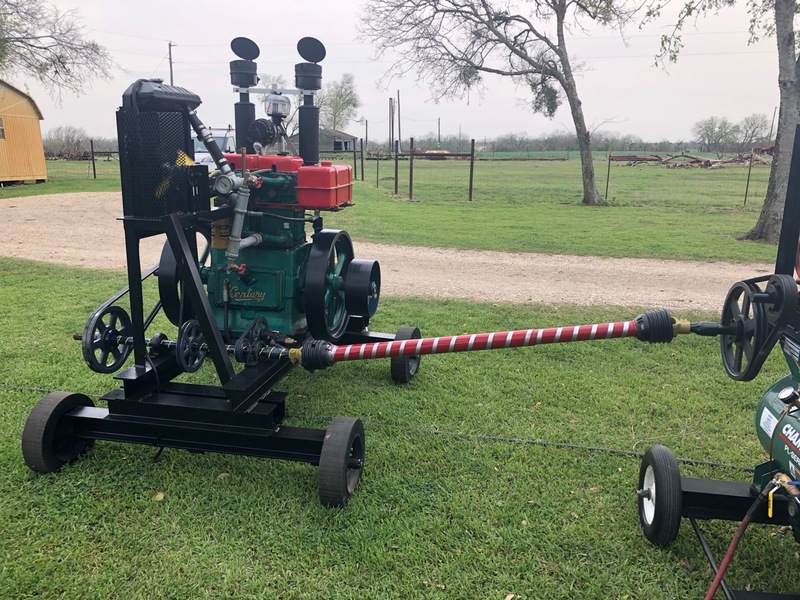 If this compressor had an engine mounted on it, this is the same signal line that usually works the engine throttle to idle the engine when the pump unloads. The regulator in this line is dual purpose, as it can be used to disable the arm function to provide continuous pump run operation by turning the output pressure down to 0, and knocks the tank pressure signal down from 170 to something in the valves control port rated operating range of 45-150 psi when in clutch mode. I usually use 60 psi. Clutch operation is as follows: when the tank pressure reaches 170 psi, the pilot unloader valve trips, supplying tank pressure air to the compressor unloaders and also to the control pipe. The control valve is flipped by the presence of air pressure on its port, and reverses the supply and exhaust to the opposite sides of the cylinder causing it to extend, and the belts get loose and the pump stops. Once the tank pressure drops down below 140 psi the pilot unloader valve resets, the control air pressure drops to 0, and the compressor unloaders are set to load (except on this compressor they won't load without lube oil pressure present in the pump as well), and the spring returns the control valve to its normal state, retracting the cylinder and tightening the belts and starting the pump. 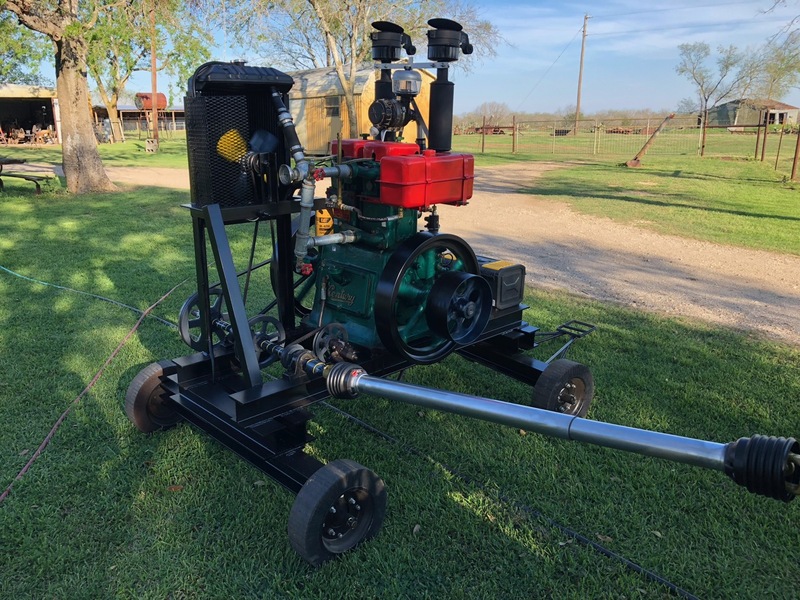 The clutch can be manually actuated by the flip tab on the pilot unloader valve for starting with air already in the tank or to prevent the compressor from starting automatically while leaving the engine running. When starting with little or no air in the tank, the clutch remains engaged, even with the flip tab set on the pilot unloader. This is because the control valve will not overcome the spring pressure in the control valve until the tank reaches about 20 psi. This hasn't been an issue for starting as the compressor isn't pumping against any tank pressure, and the unloaders will start to work when air begins building. Sounds like a well thought out and executed system! Thanks for the good details on your pneumatics, 2ton46. Using the pilot valve for controlling the cylinder is a nice straightforward all pneumatic design. Sometimes I need a break from electronics and making a version of your clutch would be a good mechanical & pneumatic project. I didin't recognize that big cylinder as pneumatic, since all my actuators are little round stainless Bimba types. BruceM, No problem, hopefully they prove useful for someone's project. Semi-functional yard art anyhow. I found a few different springs to use up on the pumps to take the slack from the linkage but are about half as strong as the ones I had on there before. This has helped the sluggish governor quite a bit. Its not yet perfect, but it is what I would consider reasonable now. Might not yet be great if I was operating a generator though, I have got about a 75 rpm drop that recovers to about a 45 rpm drop at the engine within a few seconds when the compressor cycles. I do believe there would be a better combination of springs than what I have, might even be able to stretch out the ones I have to reduce their force a bit but still accomplish the goal of taking out the linkage slop. Never figured finding springs would be as difficult as it has turned out to be (at least ones I can handle before purchase). 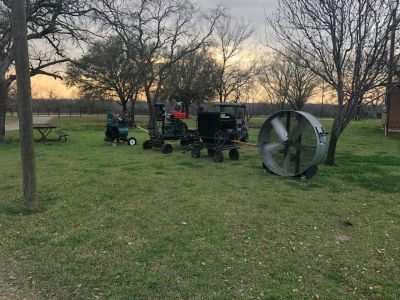 Weather and other business hasn't been ideal for messing with the projects lately, but I'll include a photo of a short test run with the compressor, the yard fan and the shop fan for your amusement. Finally had some decent weather over a few days when I had time, so I did some painting. Everything is looking much better. Went with a low gloss black for the frame and some accents, and then decided to use some paint I had around. Settled on metallic blue for the belt pulley and driveshaft, and '40's chevrolet engine gray for the v belt pulleys, and the exposed areas of the engine shaft that aren't used for the crank handle. No paint on the area for the crank handle so it continues to function. Then added some yellow to some fan blades (the metallic blue on the others, kinda tricks the eyes to make a green to match the engine when in operation lol) and put a spiral around the driveshaft with it. Looking pretty sharp. Also painted the Compressor frame and clutch assembly, mostly low gloss black. Also in keeping with the theme, put some red and silver together for a spiral on the unpainted driveline I had. The lighting wasn't that great today, but it looks good in action. Yesterday with driveline drying for the red coat. Forgot to get one after the red went on but the lighting is a bit better for the rest. Just a few touchups and I'll consider it successfully painted. Here is a closeup of the compressor nearly done with the painting after re assembly. That is one purdy machine! Had a small event at the Farm here over the weekend, and figured it would be an ideal time to get out the 'Roid and put it to some use, even if it was solely entertainment. Ended up with it powering quite a Rube Goldberg setup, but it was a hit. 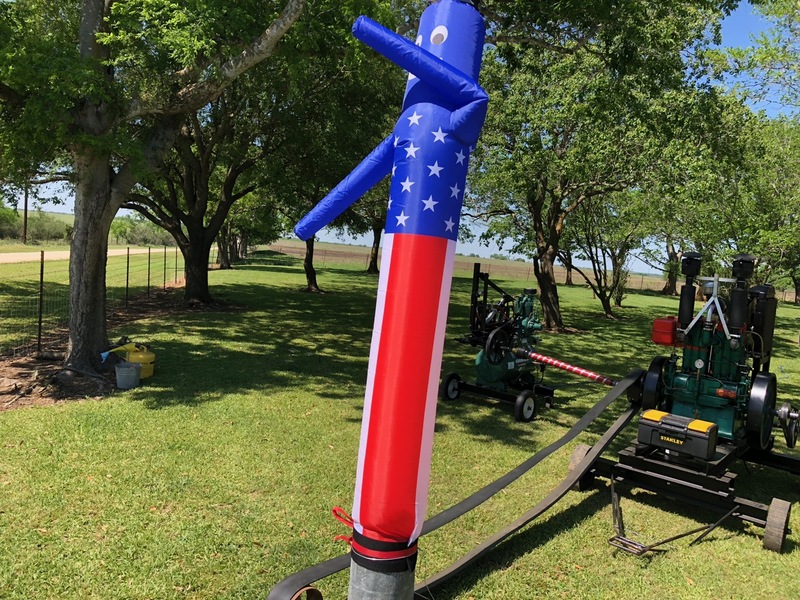 Had it connected to a small fan for a wacky wavy inflatable tube man near the gate, and then the yard and shop fans for a breeze near the tables, and the air compressor to power a small pneumatic engine. The little Hatz power unit was used as an idler for the belting. It could also double as a starter for the 'Roid, but it complains about the mass that it has to accelerate to accomplish the task mainly due to the light construction of the unit not the engine itself. It also could be used to power part of the display, but not all of it, as it makes about half of the power of the 'Roid. As a side note, that little Hatz seems like it could be made into a neat little generator set, especially if setup to operate around its peak efficiency rpm ~2300. It would probably still be able to handle about a 3KW load at that speed. I'm thinking that pneumatic engine will be great for an ice cream / frozen adult beverage maker. It doesn't turn too fast but makes a lot of torque. I made it out of some spare parts and scrap metal along with a cylinder. Somehow I managed to get the cam pretty close only with an angle grinder and a hacksaw. Here is a short video and a photo for your enjoyment.